Barbara “Barbie” Hazel Smith passed away peacefully Friday, April 12th, 2019. Barbie was loved by so many people. She was welcomed into the gates of heaven by her loving husband Clayton; daughter, Sue; sister, Helen Johnston and parents, Gene & Helen Lett. She is survived by her daughter, Debbie (Rex) Ramsey; sisters, Carol Lett and Judy White; brother, Art (Mary Jo) Lett; grandchildren Justin (Amanda) Ramsey, Jason (Michelle) Ramsey, Scotty Smith, and Samantha Smith; five great-grand-children, Dylan, Allison, Abby, Devon, and Alex Ramsey and a host of other family and friends. 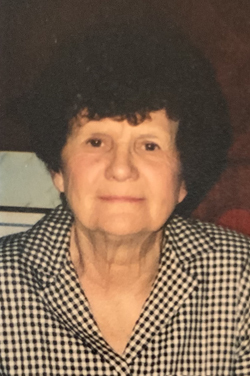 Barbie was a loving and feisty lady that enjoyed spending her time at Prairie Meadows playing the slots, eating all the chocolate she could get her hands on and being with her family, especially her daughters and her great-grandson Dylan. The family will greet friends from 10 am to 12 pm Wednesday, April 17, 2019 at Hamilton’s Southtown Funeral Home, 5400 SW 9th St. Funeral services will be held at 12 pm Wednesday at the funeral home with burial to follow at Pleasant Ridge Cemetery in Orilla, Iowa. Memorial contributions may be directed to the family in loving memory of Barbie.